Just over a month from now, Marvel’s next TV show debuts, featuring Jessica Jones. But who is Jessica? She’s not as well known as Daredevil or the Agents of SHIELD, even though she spent some time as an Avenger in the comics. So here’s everything you need to know about Marvel’s most superheroic detective. 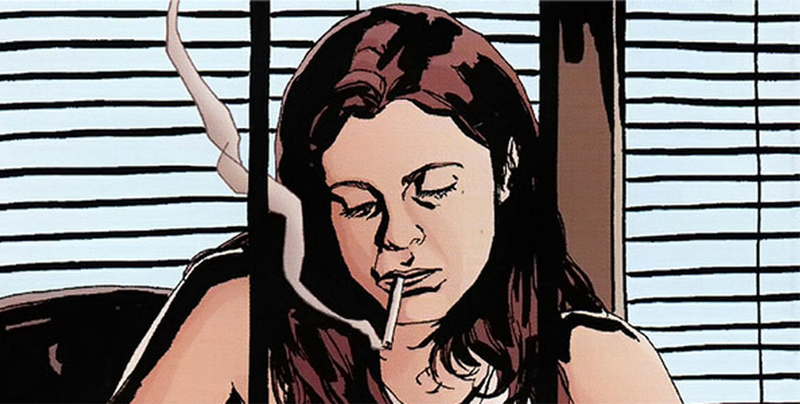 Jessica Jones made her debut in the comic Alias by Brian Michael Bendis and Michael Gaydos in November 2001, one of the first launch comics of Marvel’s new, R-Rated comics imprint MAX—but Alias began with Jessica not as a superhero, but a private investigator, working around the fringe of New York’s superhero scene and solving cases. Over the course of the comic’s 28 issues, Bendis and Gaydos slowly peeled back layers of Jessica’s history, including her superhero origins. And we learned how she began as Jessica Campbell. Jessica’s birth parents were killed in the same accident that granted her superhuman abilities: a chemical spill during a car crash that left her in a coma for months. After being orphaned and taken in by the Jones family, Jessica’s powers—superhuman strength, flight, and limited invulnerability—began to emerge. She kept her powers secret however, until she saw Spider-Man battle Sandman at her High School (not knowing that Spider-Man was her classmate and high school crush, Peter Parker), and this set her on the path to superhero-dom. Jessica’s first superhero identity was Jewel, and she had a minor career as a superhero of little renown. By the time Alias begins, Jessica has already given up her career as Jewel, and fans had to wait for the final arc of the series—The Secret Origins of Jessica Jones—to discover just why. For this storyline, Bendis revived an equally obscure comic character for Jewel to go up against. One of the major limitations of MAX as an imprint was that, although its comics took place in the main Marvel Comics universe, it was heavily restricted in the characters who could appear in its pages. Marvel didn’t want the image of their most iconic (and kid-friendly) heroes to be associated with the adult content of the MAX comics, so Jessica’s main villain—and the source of much consternation about the Netflix adaptation, where he’ll be played by David Tennant—was a rarely used character from the pages of Daredevil: Zebediah Killgrave. Killgrave, better known by his villain name, The Purple Man, first appeared in Daredevil #4 in the 1960s, but had faded from Marvel Comics almost entirely by the 1980s as Daredevil himself went underwent a gritty semi-reboot—that is, until Alias. Killgrave was a former spy who, while on a mission, was doused in a mysterious gas that turned his skin purple and gave him the power to overwhelm the minds of other people using pheromones. Basically, Killgrave could get people to obey his every command. Adopting the Purple Man moniker, Killgrave turned to violent crime: most infamously his kidnap and mental torture of Jewel. Following a minor run in with Killgrave, Jessica fell prey to his mind control, and became a horrifying tool for the criminal. For eight months, Killgrave abused Jessica psychologically and physically, using his powers to make her want to stay and endure his torture, in a sort of mentally-induced Stockholm syndrome. Eventually, in a fit of rage, Killgrave commanded Jessica to kill Daredevil, sending her to Avengers Mansion. The further she strayed from Killgrave, however, the less strong his grip over her grew. But it wasn’t enough for Jessica to break free. She attacked the Scarlet Witch (mistaking her red costume for Daredevil’s), and with the Avengers unfamiliar with her career as Jewel—and unaware that she was under Killgrave’s control—they attacked Jessica savagely, as she tried to flee the Mansion. Only the pleas of then-Ms. Marvel Carol Danvers got the team to stop attacking her, but they left Jessica in a coma. When she awoke from her coma, Jessica underwent psychic therapy with Jean Grey to ensure Killgrave could never control her again—but Jessica was still traumatized, and horrified with the world of superheroics. The violation she’d endured at the hands of Killgrave, combined with the fact that no superhero cared enough about her to realize she was missing for nearly a year, saw her discard the Jewel persona and become the P.I. we met at the start of Alias. But by the time Jessica’s origins had been revealed, Bendis and Gaydos were increasingly frustrated at the restrictions placed upon Alias at MAX. Alias came to an end, and the team brought Jessica and its cast of characters over to a new ongoing series, The Pulse, in 2004. Instead of a Private Investigator, Jessica was now a special consultant for The Daily Bugle’s “Pulse” section, which focused on superhero-related stories. At the same time, Jessica entered a committed relationship with Luke Cage, a confidant and sometimes-bodyguard who had appeared throughout Alias, culminating in a relationship that began after Jessica became pregnant with Cage’s child. Following the birth of her child, Danielle (named after Luke’s best friend, Danny Rand/The Iron Fist), Jessica and Luke got married. Jessica left the Bugle and became a stay-at-home mother, while Cage worked with the Avengers. And for a while, she became a background character in both Young Avengers and New Avengers. Jessica served as a grounding force for the heroes around her as well as Luke, a reminder of the lives they lead outside of their costumes—as well as to highlight the increasing danger of the superhero life as part of not one, but two separate Marvel events. During the height of Civil War, Jessica found herself at odds with her husband, who joined Captain America’s anti-registration Secret Avengers—while she chose to register, so she could keep their daughter safe instead of going on the run. Shortly after, during the Skrull Invasion, Danielle was kidnapped, eventually sparking Jessica to return to the superhero identity of Jewel, so she could inspire and protect her child. As Jewel, Jessica became a major member of the New Avengers during the 2010 New Avengers comic series... but her original name didn’t last long. Just eight issues later, to honor her husband’s hero name of Power Man, Jessica ditched Jewel’s identity altogether and became Power Woman. She served with the New Avengers for two years, but the drawbacks of a superhero life caught up with her once more. Although Danielle was kept well guarded at the Avengers Mansion (by Squirrel Girl, acting as the child’s nanny at the behest of Cage and Jones), eventually the stress of potential threat on the Mansion led to Jessica retiring yet again—much to the chagrin of Luke, although her husband eventually relented. The pair left Avengers Mansion and the New Avengers team altogether, moving to New York to begin a new life together... before Cage, to Jessica’s displeasure, began his own Avengers spinoff group, the Mighty Avengers. This time, however, Jessica Jones-Cage decided not to join him, only to offer support while she looked after Danielle. The Mighty Avengers, featuring Jessica in a supporting role, continued up until this year’s Secret Wars, and the eventual reboot of the Marvel Comics Universe in “All-New, All-Different”—but both Jessica and her husband have yet to be seen in any of the 60 upcoming comic series planned as part of Marvel’s big reboot. It’s hard to tell where Jessica’s rocky career as a superhero and mother will take her next: but with both Jessica Jones and Luke Cage heading to Netflix within the next 12 months, it wouldn’t be surprising to see her enter the spotlight again. Perhaps she’ll be following the format of the TV series and returning to her private investigator roots once more, 14 years after Alias hit shelves.